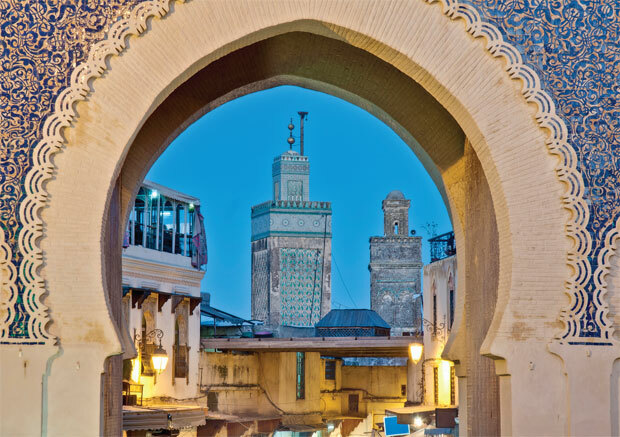 Just a three-hour flight from the UK, we certainly felt a lot further from home when our plane touched down in Fez, Morocco's oldest imperial city. Leaving behind London's late-October, single-figure temperatures, we disembarked the flight into a 36°C wall of heat. Although the locals told us it was uncharacteristically hot for the time of year, Morocco is popular with UK tourists as it's one of the few short-haul destinations with relatively hot weather all year round. After a short transfer, we were well and truly into the heart of the city. Dominated by the huge medina, called Fes el Bali, this authentic Arabian outpost is a shock to the senses for European tourists. Comprising no fewer than 9,500 tiny alleyways, the medina is an UNESCO World Heritage Site. It's also thought to be one of the largest inhabited car-free areas in the world, as vehicles just can't navigate the tiny streets. With donkeys and mules the only method of transport, it feels like the land that time forgot. If you want a glimpse into what life was like hundreds of years ago – try to ignore the mobile phones – then Fez's famous medina is the place to go. Our destination was Palais Amani, a luxury riad situated just within the medina's magnificent walls. Hidden away behind huge wooden doors, we stepped out of the chaos and into a stunning and peaceful retreat. 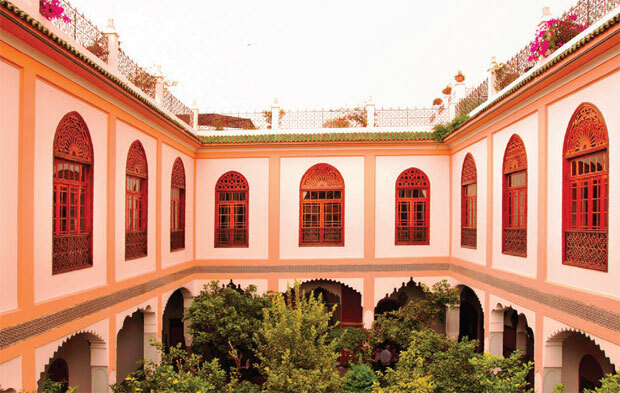 A traditional Moroccan palace with a pretty central courtyard, Palais Amani was rescued from its state of disrepair by Moroccan businessman Abdelali and his wife Jemima, who lovingly restored it into a boutique hotel. There are 14 rooms at the riad, ranging from Classic Rooms to Exceptional Suites. Each one boasts an en suite bathroom, air conditioning and a modern sound system. They are all traditionally decorated with intricate mosaics, tiles and embroidered Egyptian cotton. Sitting among the orange and lemon trees in the hotel's central courtyard, it's hard to believe the medina is just outside the gates. All we could hear were the flapping wings of the tiny birds washing and drinking in the pretty fountain, and the occasional holler of the five-times-daily calls to prayer. 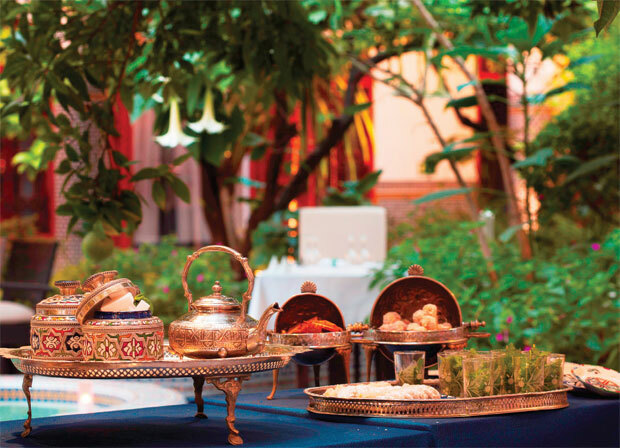 Traditional Moroccan breakfast is served every day, with no less than four courses to enjoy. Starting with fresh fruit and yogurt, you can then indulge in breads with olives, honey, jams and cheeses, before trying a speciality dish. These change daily and range from an unleavened, crumpet-like bread to harira, a classic soup made with tomatoes, chickpeas and lentils. If that's not enough for you, the friendly chef will then whip up an omelette or any eggs you like. The hotel's restaurant also serves lunch and dinner, and guests can learn more about how the food is prepared by attending a cooking workshop. The four-hour experience takes in a shopping trip to the souk, a cooking demonstration with the chef in the kitchen and a lunch to taste your wares at the end of it. You also receive a Palais Amani apron, recipes, ingredients list and spice basket so you can recreate your dishes at home. Fez is an Islamic city that prides itself on its religious prowess, so finding an alcoholic drink isn't easy. Of course, there's the hotel bar, but if you want to venture further afield, it can be tricky. Hail a taxi to the new town and you'll find a few decent European-style restaurants and bars, but if you want to stay closer to home, the Mezzanine bar, located just outside the medina at Bab Bou-Jeloud (the blue gate), is a welcoming spot. With three floors, including a rooftop, you can enjoy a drink and something to eat, whatever the weather. When you've well and truly worn yourself out wandering around the medina's laneways, why not indulge in my favourite of Morocco's traditions, the hammam? A variant on the Roman bath, it's a very important part of Moroccan life. Men, women and children attend public hammams once a week to catch up with friends and family, and to receive their weekly cleanse. In the Palais Amani, the luxury hammam is made up of a hot room, exfoliation chamber, separate shower and a relaxation room. After donning our robes and being led down candlelit steps, we were treated to a Royal Hammam – the perfect choice for honeymooners. First, two therapists wordlessly bathed and scrubbed our feet, before washing our bodies and rinsing the soap off in the hot room. Our bodies and hair were then masked in clay before being rinsed again and scrubbed to within an inch of our lives with a traditional exfoliation glove. After relaxing in the steam room, it was time to wash it all off in the showers and cool down with a refreshing drink. To say this was greatly needed after a couple of days getting lost in the mesmeric medina is an understatement. I can certainly see why the Moroccans choose to have them every week! A half-day medina tour with a legitimate guide. Ask the hotel concierge to book one early in your trip. Sundowners in the Palais Amani's rooftop bar, where you can watch the sun set over the Atlas Mountains. Fez is renowned for its tanneries, where animal hides are treated and dyed then made into leather goods. A trip to one of these famous spots is a must, but don't forget a sprig of mint to hold to your nose in case the stench gets too much. Languages – Many Moroccan dialects, French is widely known, English is spoken in the hotel. Health – Only drink bottled water and be prudent about what you eat and where. Transport – Taxis (called 'petit taxis') are prevalent and can be flagged down easily at junctions. Try to insist the meter is turned on. Dress – As a strict Muslim country, women in particular are expected to cover up in public. Women's legs, shoulders and chest should all be covered, while both sexes should stay away from vests, T-shirts and shorts. False guides – Fez is known for its fake guides that will speak to you in the medina then try to take your money for little in return. Steer clear and give a simple 'No, thank you' if approached by them. Pickpockets – Be careful with your belongings when in the busier parts of the medina and town. Beggars – Like most cities, Fez has its fair share of beggars, it's recommended that you don't give anything to them. How will you be spending the day before your wedding?